Proposal that shows accurately the classical geometrics. It is a visual surprise for its size thanks to its slender chrome plated steel legs. It offers a different solution for most contemporary spaces. The reclining headrest gives the right comfort of a high backrest, due to the full support of our back. 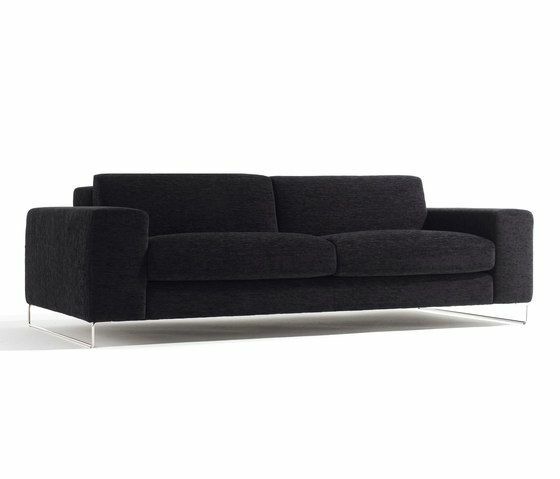 Wide modularity sofa, allowing all kind of compositions for your home. Modules joined by lateral anchorage. Height measures are with p-28 steel leg. Sofa or module larger than 200 cm are prepared so the arms can be removed locally. MATERIALS: – Solid wood frame, covered with HR 30kg/m3 foam. Suspension made with Nea elastic webbing, offering quality guarantee of 10 years. – Seat cushion in HR 35 kg/m3 foam, plus 3cm of extra soft lay. Internal cotton cover. – Lumbar support cushion of HR 30kg/m3 foam, covered with H 150gr fiber. – Headrest cushion made of HR 30kg/m3 foam, covered with H 150gr fiber. Cushion upholstery fully removable. – Leg p-67 beech wood, p-28 and p-14 chromed metal. – Finishes: Double seams.